My last several articles have covered lots of software for doing research in the sciences. But one important area I haven't covered in detail is the resources available for teaching the next generation of computational scientists. To fill this gap, you can use the code provided through the Open Source Physics project. This project is supported by the American Association of Physics Teachers (AAPT) and the National Science Foundation (NSF), and it offers several different packages for doing simulations and analysis. This lets you run the simulation on your desktop. But, because these are Java programs, you can put them a Web site and run them within a browser. This means you can include them on your science site and show visitors simulations of the systems you might be trying to explain. Figure 1. 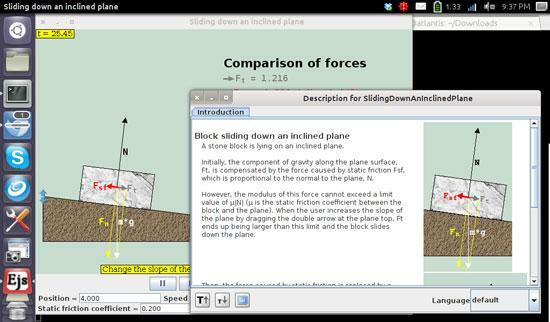 For example, starting up the simulation of sliding down an inclined plane also pops up some introductory material. Some of the simulations provided by Open Source Physics have parameters that you can alter to change the runtime details of the simulation. These parameters might be items like masses, velocities or field strengths. If the simulation you are using does have settable parameters, there will be an option to save the model details off to a data file. You can do this by clicking File→Save Model. The data file is an XML file, so it should be relatively clear if you want to edit the file directly with a text editor. 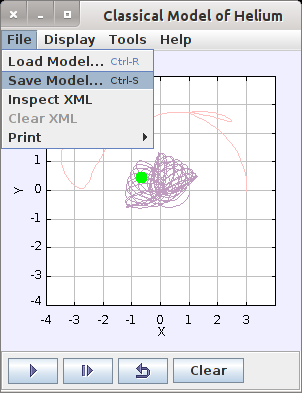 You then can reload these parameters in the simulation by clicking File→Load Module. 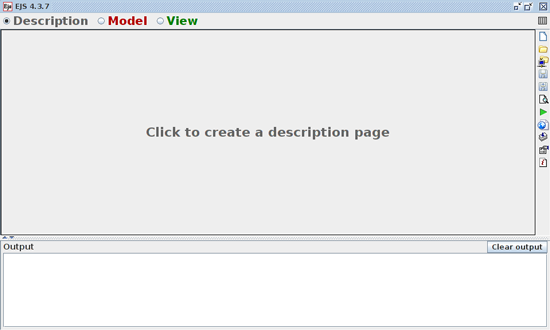 This way, you can share models you've developed with other people by sharing the XML data file. Once you have gone beyond the material covered by the pre-packaged simulations, you probably will want to see what other systems you can model and analyze. Open Source Physics provides a system called Easy Java Simulations (EJS) to do just that. This Java program provides a nice and easy interface to allow for prototyping, testing and distributing your own simulations. EJS is good for educational situations because it allows for relatively complex simulations without needing to know a great deal about programming. This pops up a console window where you can set some initialization parameters and start one or more EJS instances. This opens a modeling and authoring tool where you can define your physical system and the details of what you are trying to model. You can run these models from within the authoring tool, so you can try things out and see whether you are getting the results you expect. Once you are happy with the simulation, the authoring tool has options to allow you to package the entire simulation as a single bundle that you can share with others. This is great when you are developing code for a class, because you can define simulations for the exact physical systems you want to teach and then package it for your students. Figure 3. The EJS console lets you define your own simulations. Open Source Physics aims to help with all aspects of teaching, so to this end, it provides a program called the Launcher. The Launcher is a central program that provides access to a series of simulations, along with supporting documentation and teaching notes. You can click on the curriculum link and search for collections that cover specific topics. Just like with the individual simulations, you either can search for a specific item or browse a list of topics for which there are curriculum launchers already prepared. You are not limited to those, however. You can use the LaunchBuilder to create your own collections. This utility lets you define the materials you want to bundle together, and then it will output a jar file that you can distribute. The actual material list is stored as an XML file, so you can open it with a text editor if you want to refine any of the entries before actually generating the distributable file. Figure 4. The Data Tool helps you do basic statistics on your data. When you are ready to go even further, the Open Source Physics project has an entire programming environment available based around the Eclipse IDE. This IDE includes the Open Source Physics libraries that are used in the simulations and the EJS code. This way, you can go further and develop your own programs without having to re-invent the wheel when it comes to common tasks. A lot of documentation is available, including several chapters of two upcoming books titled Open Source Physics: A User's Guide with Examples and An Introduction to Computer Simulation Methods. The Open Source Physics project provides two other tools: Data Tool and Tracker. First, let's look at Data Tool. 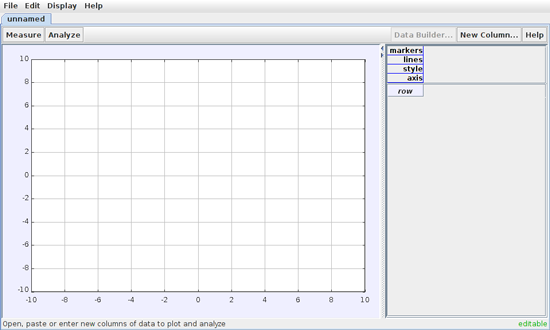 Data Tool provides plotting and data-fitting functions to help you analyze experimental data. You can change the appearance of plots interactively by selecting parameters on the main screen. Once your data is loaded, Data Tool also can do basic statistics on the data set. So, you quickly can get items like mean, median and standard deviation. With your data plotted, you can get the slope and area under curves in the plot. Often, you collect data to try to demonstrate some relationship between inputs and outputs. To verify this, you try to fit some function to your data. Data Tool provides a number of predefined functions that you can ask it to try to fit. Or, you can use Fit Builder to define your own functions to be used in the fitting routine. You also may find that you need to massage your data before either plotting it or trying to fit it. This may involve applying different types of mathematical transformations to your data. In regular data analysis, this would be a step you would handle before importing your data, but Data Tool provides a function called Data Builder that allows you to do this right here. The last tool to look at here is Tracker. 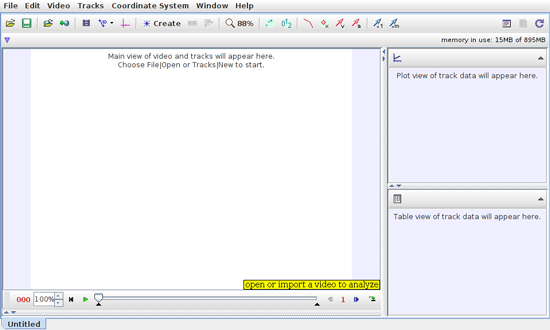 Tracker can do image and video analysis by using the functionality in the Open Source Physics library. Tracker is capable of object tracking in video, giving you position, velocity and acceleration. It can provide overlays and graphs, special-effects filters, multiple reference frames and calibration points. It even can be used to analyze spectra and interference patterns, allowing you to analyze laboratory measurements. As an example, you can overlay simple dynamic particle models on top of a video clip. This allows you to take a video of an experiment and then use it to make your measurements and analysis. There are several examples on the Web where people have used this to model all kinds of events, including modeling the physics of Angry Birds. A quick Google search will open your eyes to what is possible. Figure 5. The tracker handles video analysis with object tracking. This short article barely scratches the surface of what is available. If you are either teaching physics or learning physics, exploring the Open Source Physics project definitely will be worth your time.